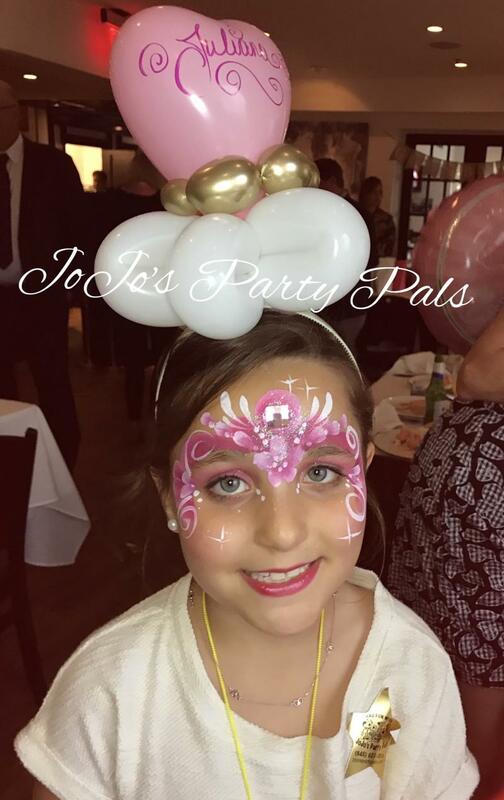 JoJo's Party Pals, Inc. - We take pride in delivering first class service. Here are some testimonials from satisfied customers. Please be sure to fill out your Customer Feedback form after your event and add your own review here as well! We take pride in delivering first class service. Here are some testimonials from satisfied customers. Please be sure to fill out your Customer Feedback form after your event and add your own review here as well! Voted Best Birthday Party Entertainer! 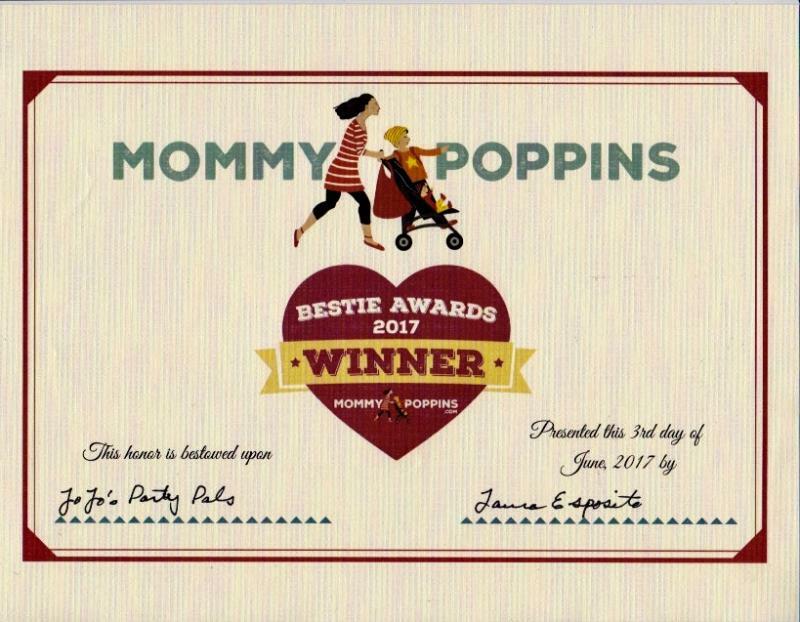 So honored to be featured AGAIN by Mommy Poppins!!!! 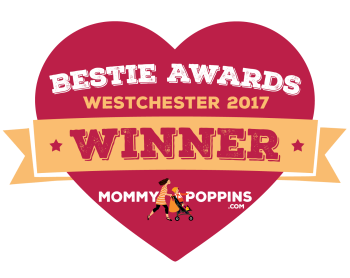 Westchester's Top Twelve In Home Entertainers!!! I made the papers and received this wonderful review!! I just wanted to thank you from the bottom of my heart for helping to make Hazels birthday party a wonderful time! You were so cute & so sweet and the children had SO much fun! I especially appreciate you including my boys in the show - they absolutely loved it! If I only I had taken a video haha! As soon as I have pictures I will send you a few, I know we have some great ones. Just wanted to thank you again! Staci & Jonathan L. Greenwich, CT. 3/24/19. ﻿You are truly awesome. All the kids loved you. We will definitely use you again. Thank you so much for a great event. You ROCK!!!! Michele R. Peekskill, NY. 10/28/18. Tiffany B. Newtown, CT. 10/27/18. Thanks so much for coming! The kids had a blast and everyone couldn’t believe the balloons! I had a bunch of people inquire about you so hoping you get some new clients! Hope to see you again at another event! I wanted to tell you the kids had a great time yesterday, it was a lot of fun! You are very talented, those balloons and the face painting were a hit! Denise ﻿L. Mohegan Lake, NY. 5/15/18. I just wanted to Thank You for the great time all the kids had on Saturday night. You were outstanding and my boys loved you!!! Thank you again!! Marianna,Thomas and Daniel B. Somers, NY. 5/12/18. Hi- thank you for making our party a beautiful and fun filled one for all the kids:) the kids had a blast! 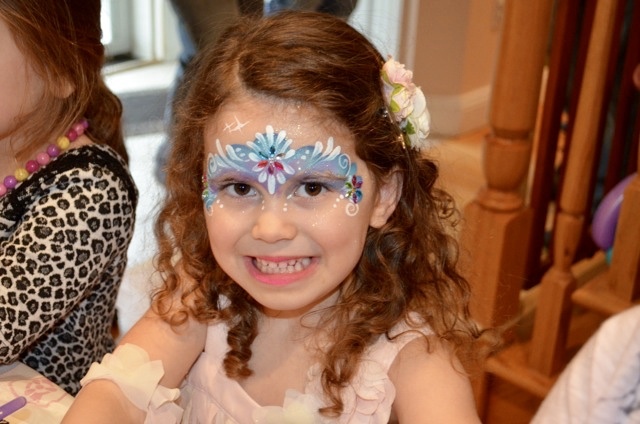 You are amazing!﻿ Thank you so much again for making Juliana’s communion entertaining and fun for our little ones! We are so sorry if it was the most difficult party if you ever took on! There wasn’t any room for you and the manager was useless! I hope you were ok and didn’t leave with a migraine....we are still recovering! Lol! Hope to see you again soon! You are always amazing. Crista and Carlo. Scarsdale. 5/12/18. Hi! Thanks so much! You were a big hit!!! The kids all had a blast, especially Kaydence!!! Jaclyn A. Mohegan Lake, NY. 2/17/18. You were amazing and all my friends want to book you. Thank you so very much! I didn't get to add an extra tip/ but we have many years of working with you ahead of us!!! God willing! 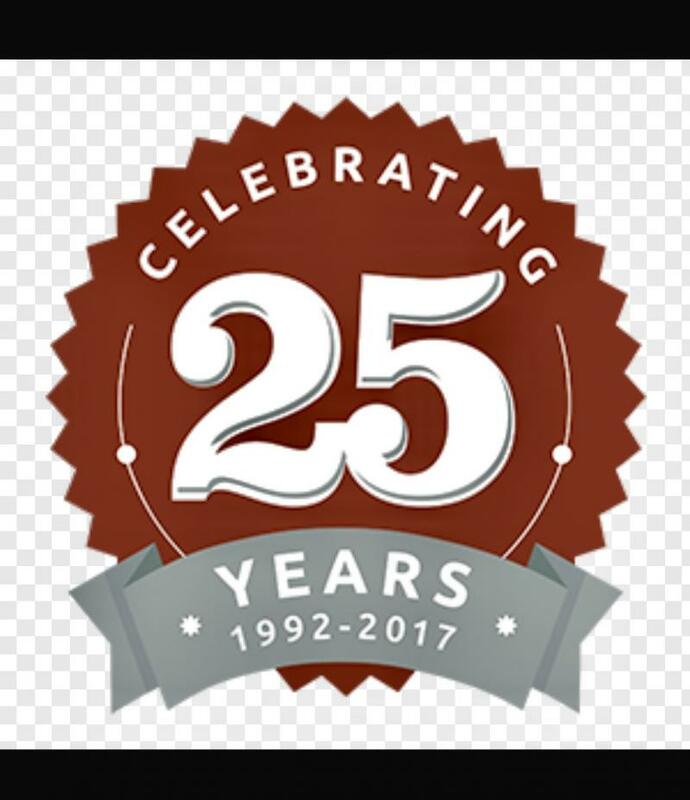 Have a great day and know you brought us so much joy. You made us all smile! We will keep in touch. Paisley M. Old Greenwich, Ct. 2/11/18. Thank you for your services. As always, everyone love you! Vanessa S. Mahopac, NY 1/6/18. Thank you so much for putting on such a great show for the kids! Everyone was talking about how great it was. They all really loved it! Crystal N. Harrison, NY 12/9/17. I've been meaning to write to you so many times. After Cameron's bday, things just moved so fast and here we are, about to go on vacation to Argentina. I just want to express my gratitude for your beauty, and commitment to make not just Cameron's day special but all the kids that attended his party. They were very engaged and enjoyed your show. I know so many variables got in the way ( snow) and you still rocked it with grace and professionalism. Thank you. Hope to meet again sometime. Happy Holidays and the best to you. Romina﻿ H. Mohegan Lake, NY. 12/9/17. You did a GREAT Job Thank You for everything. Also I attached some great pictures. 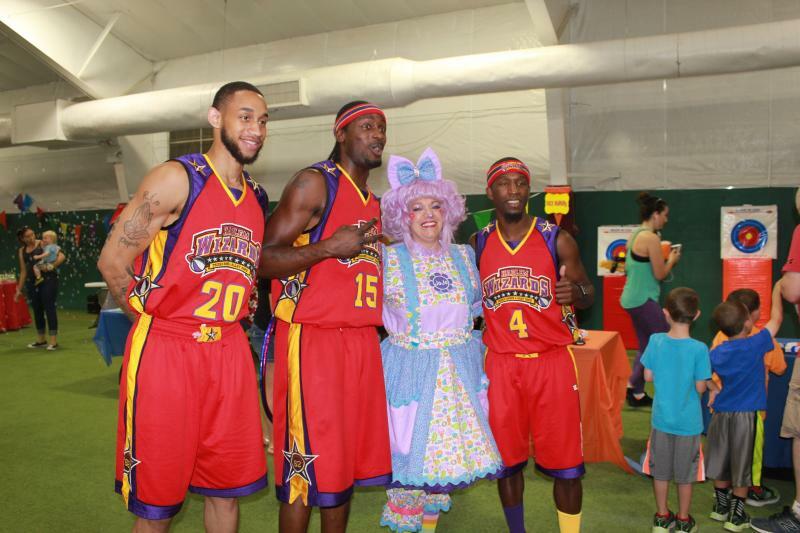 With The Harlem Wizards! Solaris Family Fun Day! July 9, 2017. Joanne thank you again for today. You did an amazing job and were so great! Hope you got home OK.
Maria S. Patterson, NY. 6/11/17. balloons and beautiful faces you painted! Thank you very much for yesterday! Annalyn and the kids had a great time! Thank you for making Annalyn feel so special 😊😊😊. Jaime L. C. Mohegan Lake, NY. 4/29/17. Thank you for making me feel so special today! You are very welcome! ! Everyone loved you. You did an AMAZING job! I hope you get business from some of the parents that were here! 100% satisfied! ﻿ Valarie R. 11/22/14. Lagrangeville, N.Y.
(Thank you Erin, and all my clients who take time out of your busy lives to write a wonderful review for me! It touches my heart, and I appreciate it more than you will ever know. I just want to let you know how you made Olivia's day!!! She was so happy to have you at her party. Thank You for making her Birthday Party so special!!!! Dina H. 12/18/16. Somers, N.Y.
My first ever handmade thank you card!!! Wow!!! Thanks so much!!! Victoria F, Wappinger Falls. 7/9/16. You were awesome yesterday at the PURE outing event. The kids and adults enjoyed your show. We thank you sincerely and hope that you join us again next year. I promise to get a ton of kids. Have a happy and safe July 4th holiday. We will be in touch. June 30, 2016. Hartsdale, N.Y. I just want to thank you. Your show was adorable and everybody had a great time. My daughter keeps talking about JoJo along with her friends. It was really a pleasure meeting you. Maria B. Cortlandt Manor, NY. 6/11/16. She was unbelievable. The kids had such a great time... They laughed and laughed. I was a little skeptical of how much they would enjoy it... And boy was I wrong. The kids didn't stop laughing and her magic tricks were awesome. She brought stickers and little prizes for all the kids and the surprise at the end of the show was really super cute. Not only great magic tricks and jokes but photo opportunities as well. It was incredible. I would hire her again tomorrow. Melanie H., Owner, Great Beginnings Preschool. Jojo- you were amazing! I am so sorry I didn't get to say good bye. You were amazing and I appreciate the little gift box you created for Carlo and Matthew. Carlo also loved the superhero balloon you made for him. Thanks again for helping make our party a success even though it was freezing! Crista T. 5/15/16. Rye, N.Y.
Heya, just wanted to thank you again for saturday, you were outstanding as usual! The cross you made Christopher was beautiful and your cute Frisby gift to him was very sweet. You always make such nice touches and go the extra mile to make all our events special. Thank you so much again and I'm sure you will be hearing from me for a birthday party!! Christina W. 4/30/16. Garrison, N.Y.
Joe C. 4/23/16. Yorktown Heights, N.Y. Thank you JoJo for all you did today!!! The face painting was awesome, and balloon creations are amazing!!! You are the best!!! And thank you so much for coming and making Andrew's birthday a memorable one !!! Everyone had a great time!!! The Lawrence Family. Jefferson Valley, N.Y. 1/3/16. I just wanted to say thank you for everything! it was amazing and Francesco had a blast! Thank you again for creating such great memories in my son's bday party! Big hug, Mariana A., Mahopac, N.Y. 11/21/15. Sara LOVED her birthday party and told me that she wants you to come next year wearing Purple. It was a really cute show, I enjoyed it as well. Kirsten F. Croton-On Hudson. 11/8/15. JASMINNE P., Ardsley, N.Y. 11/1/15. Thank you JoJo for everything!! Your work is amazing and you definitely kept the children entertained! I also love Logan's bubble guppies balloon! Have a good night! Ashley M., Beacon, N.Y. 10/10/15. I would like to say thank you again for your service. It was great, all of the parents were raving about how awesome you were. I look forward to doing business with you again. Onika﻿ B. White Plains, NY. 8/1/15. Just wanted to thank you for a great show !!!!! I saw lots of pictures and videos and it looked like a great time, and from what everyone said it was !!! My mother and daughter and son said it was really great, they had a very nice time. Luke really enjoyed it and was so happy with everything, he loves the spongebob balloon, I told him it might not last forever and he was sad about that...LOL . The rabbit was a big hit, and I saw the video of that .... Lukes face was priceless. Thank you for making his birthday a special one he will always remember. 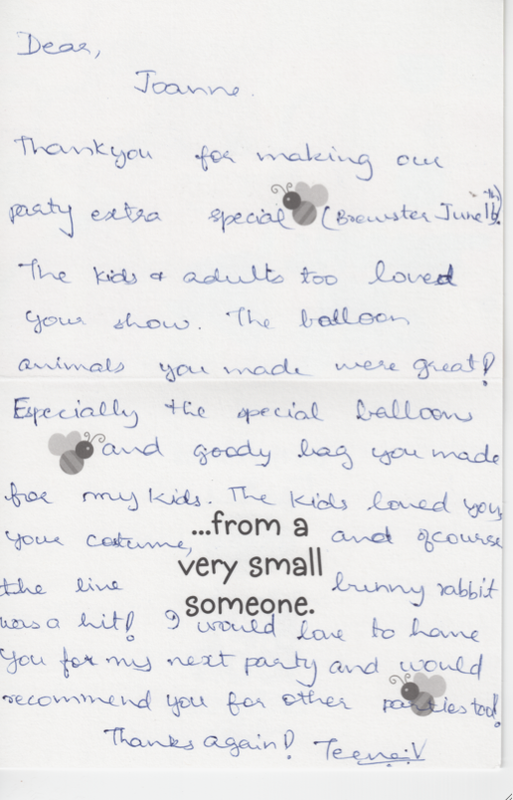 All the balloons were fantastic, and thank you for making one for all the children. Thanks again !!!!! Lisa G. Yorktown Heights, NY. 7/28/15. JoJo (aka Joanne) was awesome! 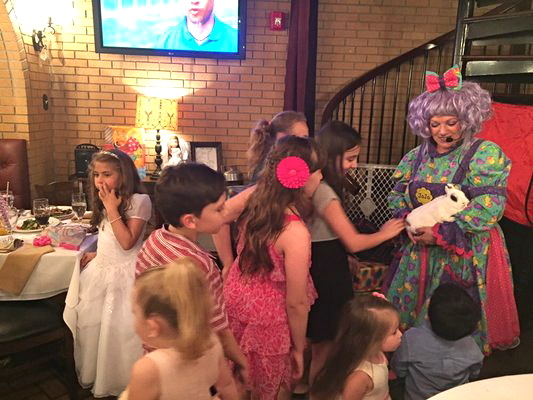 The kids all loved her magic show and especially the bunny surprise at the end! 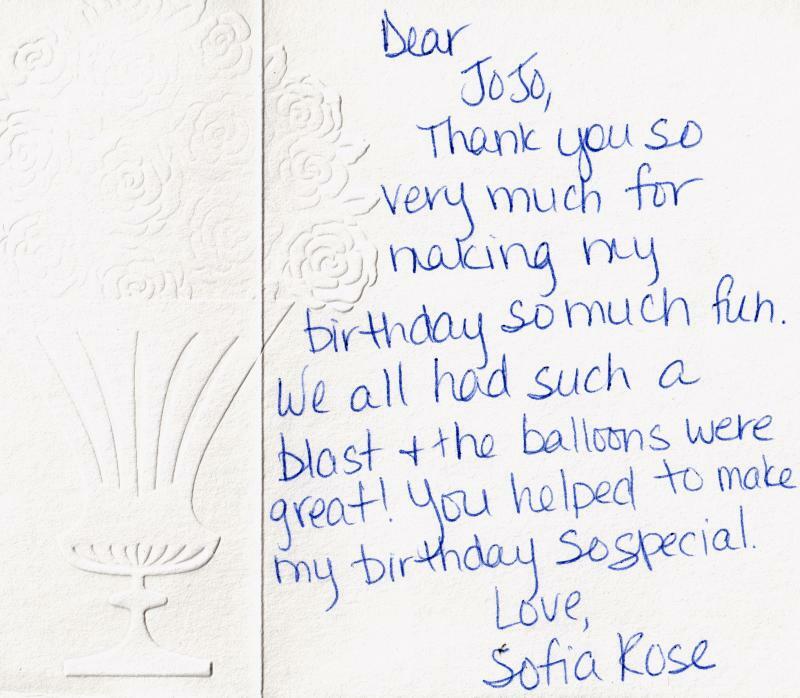 She did such an amazing job on all the special balloons that I ordered for the favor to give to each child! Her work is amazing and so entertaining. Thank you for making Alexandrea's Communion Day even more special! Tina S. White Plains, NY. 5/16/15. Thanks so much for a great party!! The kids loved the show and especially the face painting! Mairead was so happy! hi! i just wanted to write you an email to thank you for coming to Abby's 2nd party. we really enjoyed having you..the kids had a great time ! .thank you again and im sure we will be seeing you! Thanks for an awesome magic show and balloon creations! They were amazing! Kids had a blast!!!! 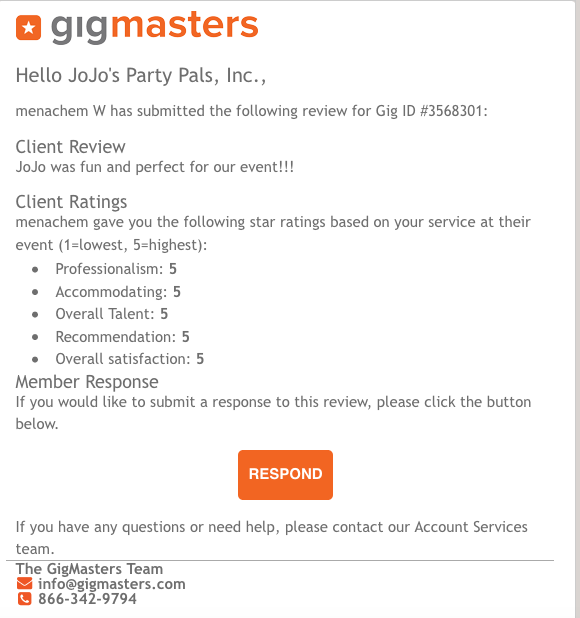 A satisfied customer who booked me on Gigmasters! I was totally lost trying to plan my 5 yr olds bday party. I found gigmasters online and found Jojo. I was looking for someone local; w/in 15 miles of us. We had my daughters party 12/21/14 and weather was a concern for me. Luckily weather was great & all showed! Once she got there, immediately the kids were captivated by her & her Jojo blue ensemble. Her magic show was exciting for not only the kids but even the adults! 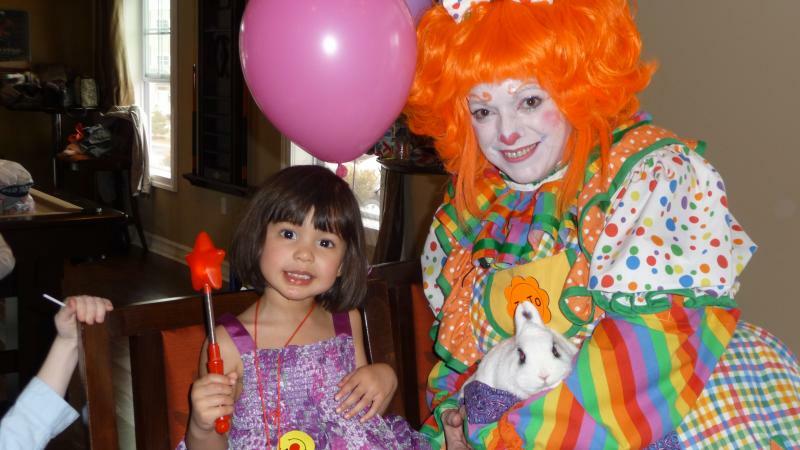 Her ballon creations were unimaginably creative, and her face painting was extraordinary . All the parents there were blown away that Jojo came from our local community. I will recommend her highly and would love to have her at another party! Hi, thanks again for entertaining the kids soooo well. Everyone enjoyed it. Hope u have a good week. Happy holidays!! Sandy K. White Plains, NY. 12/13/14. Thank you drawings from two satisfied customers!! Amanda B. 10/18/14. New Milford, Ct. I just wanted to drop you a quick note to say thank you so much for today! You were amazing!!! We really appreciated all your hard work! It was all so amazing!! I will definitely be contacting you again. Thank you. Hope you have a great weekend! The P. Family, 3/22/14. Poughkeepsie, N.Y. I just wanted to thank you for the SPECTACULAR job yesterday. There was a lot going on at the party and I didn't get a chance to thank you for the awesome little gifts that you made special for Riley! THANK YOU! All of the parents told us how the kids talked non-stop about the party and your entertainment on the way home. A lot of them asked for your contact information as well! Thank you so much for making Alice's first birthday party so fun and so special! The kids (old and young) loved you. Can't say enough great things about JoJo! Michelle A. 1/12/14. Mahopac, N.Y. I just wanted to Thank you so much for making Andrew's 1st birthday party a big hit!! The kids and the adults really enjoyed you!! Your face painting was amazing, and you totally impressed me with the Bob the Builder twisty balloon!! That was awesome!! I will definitely call you for the next event!! Have a wonderful day!!! Thanks for a great time. My kids loved the show. My daughter is asking to have JOJO again for her birthday next year!! I can’t thank you enough for being a part of Rye Chamber’s Mistletoe Magic! You were a big hit! Susie McNamee, the event coordinator said, “JoJo was the perfect person for the event.” I thank you for coming and so appreciate your amazing talent. The line in front of your booth was the longest at the event, other than the hotdog line! I took some wonderful photos of you with the kids and the expression on their faces when they looked in the mirror and saw themselves was beyond adorable. My 22 year old daughter wanted to have her face done too and didn’t want to remove the beautiful flowers you painted on her. You really were a gift to the kids of Rye and hope next year we can do this again! Thank you so much for the show you did. Christopher cannot stop talking about it and truly believes he performed magic when the bunny and lollipops appeared. We will keep you in mind for future parties. PS. The Mickey and Minnie balloons are amazing. Look forward to the tantrum when they deflate. How are you? Just wanted to thank you again for the show. Everyone really enjoyed it and I think you did such a great job. Danny loved his gift and special balloon too. Christina W. Cortlandt Manor, NY. 9/14/13. Thank you for an amazing time!!! You were absolutely amazing with the children. Your face painting was outrageous and amazing!!! Wonderful show! Maria's art work. All the parents texted me this morning telling me that the children woke up talking about you!! Especially Maria. I can't tell you enough how amazing and professional, organized and wonderful at engaging the children!!! Thank you again and again!! 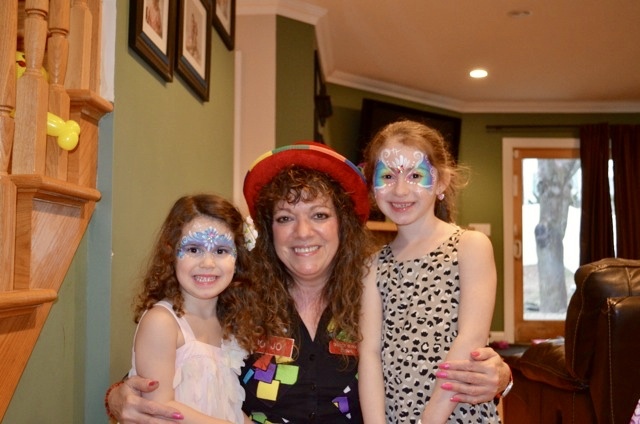 You made Maria's Fancy Nancy party even fancier!!! Thank you so much for a wonderful show! 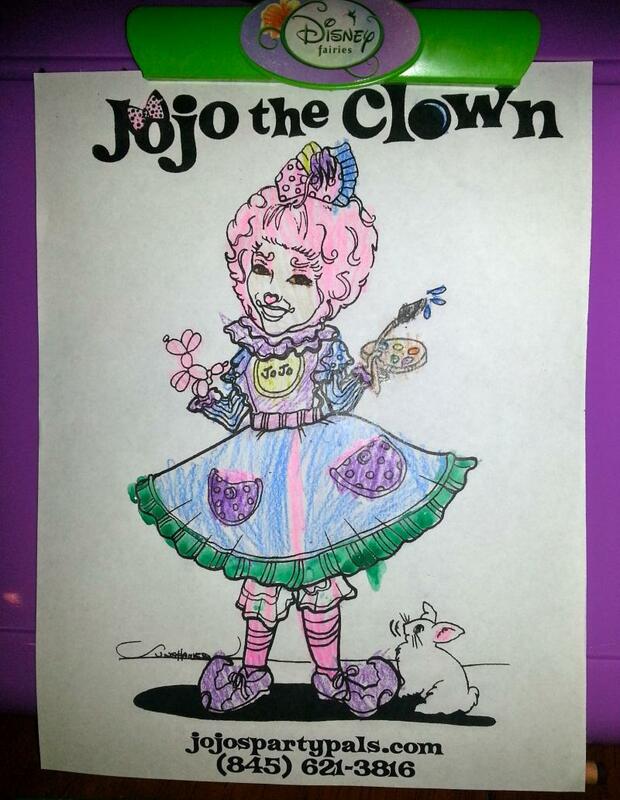 "Dearest JoJo! Thank you so much for an amazing party. 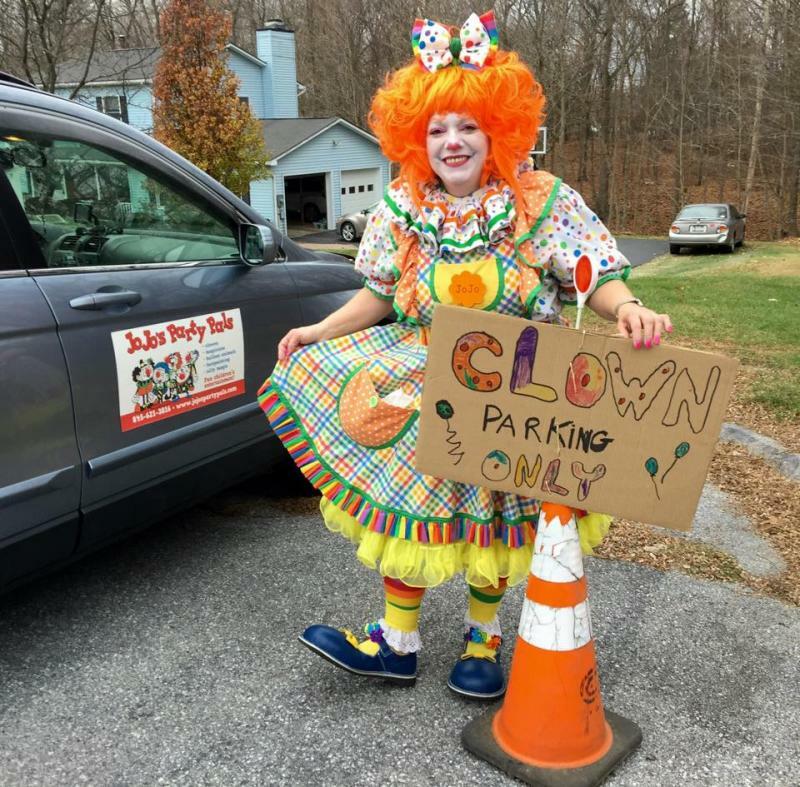 I went on the limb to book you without ever seeing you as a clown or in person prior to the party. And after you left both my little munchkin and I were in love. I loved your professionalism and punctuality, jokes and magic tricks. My daughter loved your outfit, smiles and a rabbit. Thank you also for a wonderful personalized gift - my little munchkin now sleeps with her basket full of goodies next to her. We couldn't be happier with your truly amazing talent and are looking forward to booking you next year. All the best, Ellie." "Thanks for a WONDERFUL party!! All the kids had a great time – and the adults enjoyed your show too. Here is a pic (excuse the drool!)" I just wanted to take the time to thank you! Tyler had a wonderful Birthday.. and he loved you! He had so much fun! You really did an "AWESOME"
The kids all had a GREAT TIME!!!! Thank you so much! You really made the party!!" Elizabeth S. Mahopac, N.Y. 3/18/12. 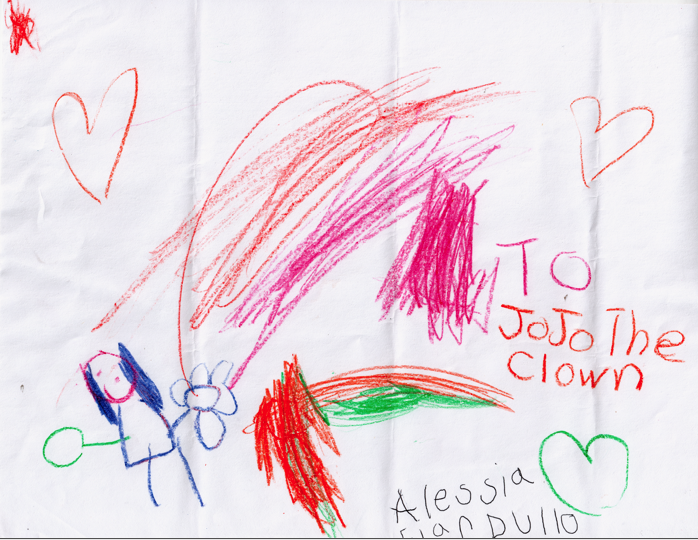 Just wanted to say thank you so much for yesterday, the kids had a great time and loved Jo Jo the clown!! The magic show, balloons and face painting were all great and a big hit with the kids. Thanks again and I will certainly recommend you to my friends!! Just wanted thank you so much for a wonderful job. The kids and the adults had so much fun. Thank you for helping to make our Annual BBQ here at the Village a success. Your performance exceeded my expectations. Although we are an "active adult community", I was a little apprehensive at first thinking face painting wouldn't go over well with our group. WOW was I wrong.- you were so well received by both the men and women I had to ask if you could stay an extra hour to accommodate the line. I was especially touched by the woman who struggled with her walker to get to you. You were so kind and patient and made her feel so very special with a beautiful pink painted heart on her arm. God bless you. JoJo did a fantastic job entertaining at my daughter's third birthday party. All of the kids had a great time and my daughter loved all of the special attention and gifts she received for being the Birthday Girl! Thank you for celebrating my daughter's 4th birthday with us!! You did an awesome job!! The kids were all given two animal balloons, of their own choosing, you even made a my little pony balloon for my daughter, which was so creative. You stayed well beyond our contracted time to make sure that all children had two balloons and all faces were painted. The face painting was amazing. I am so pleased that we chose you to entertain the children-you had handled my older daughter's party several years ago and this one was just as great!! 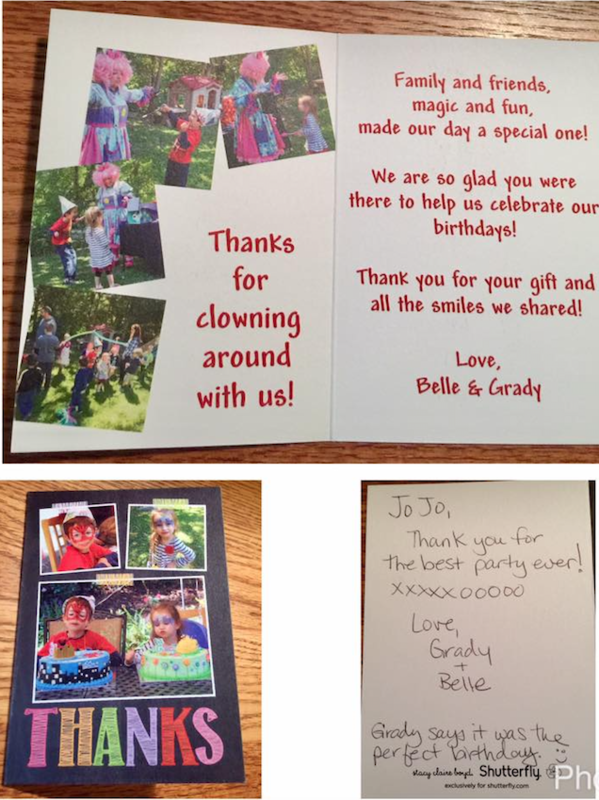 I would highly recommend you to anyone who wanted Jo Jo the clown to entertain at their party. FABULOUS! 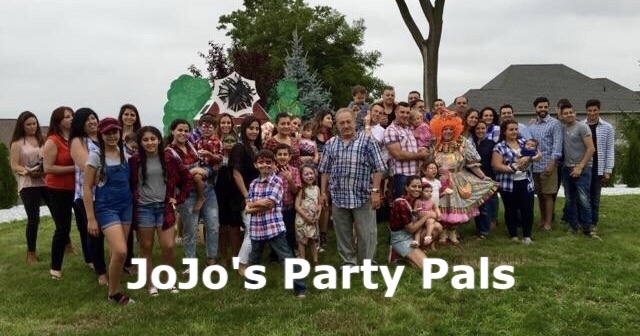 We used JoJo for our 3 year old son's birthday party at his daycare. All the kids loved her show, and the parents thanked me later becuase their kids could not stop talking about it! She was amazing with the balloons! Thanks for yesterday Joanne. You were a hit! 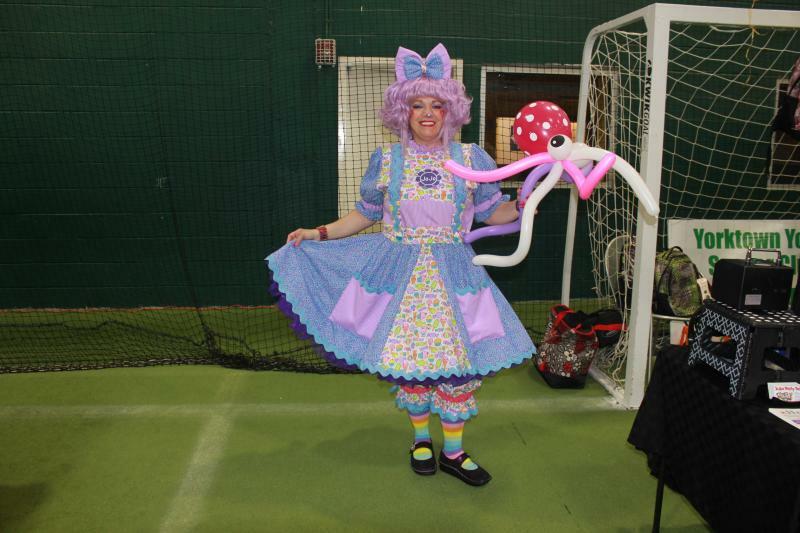 Aside from your balloon capabilities, your genuine friendliness towards the kids was refreshing. Please jot us down for next year’s festival. Hi Joanne, I just wanted to thank you for Sat. The kids loved you and Bree has already requested you for her party next year! Thank you again! Wow ! Great entertainer. Kids loved her, adults loved her, I loved her!! She is the ultimate professional yet she is very friendly and down to earth. JoJo is very accomodating and was completely prepared with great colors and design selections for the kids to chose from. Very talented. 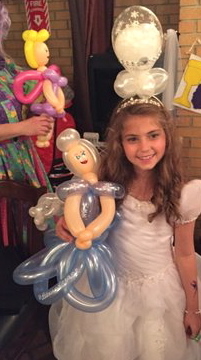 The amazing balloon figures she created left many of my guests in awe. I would definitely recommend her services. I was so satified and impressed that I will be booking her for another party in March 2013. I had a great time watching your magic show and your face painting was amazing. I know all the children were happy especially when they got their balloon animals I got so excited I had one made for myself. I would definitely recommend You to my friends and book you again for future parties. Thank you so much for everything. I just wanted to say thank you so much for Saturday. Everybody had a wonderful time. You did a great job. Everybody was happy. The kids were happy. It was all I could ask for. You gave me some block of time with some serenity, so I thank you for that. And you did do a wonderful job, and I promise you that you'll be hearing from me for the next 10 years, or until all my kids are too old for you! And if I just stop having kids at some point! So thank you again and I hope you have a great Thanksgiving. I'll talk to you soon! Christina W., Garrison, N.Y. 11/17/12. I just wanted to say thank you so much for everything yesterday at my son's birthday. The kids had a blast with you. You were so G and wonderful. We will definitely be calling you again. I passed your cards out to most of my friends. Thanks again so much for making John's day special. ﻿I am sorry it took sooo long to write but its hard with 2 little ones. 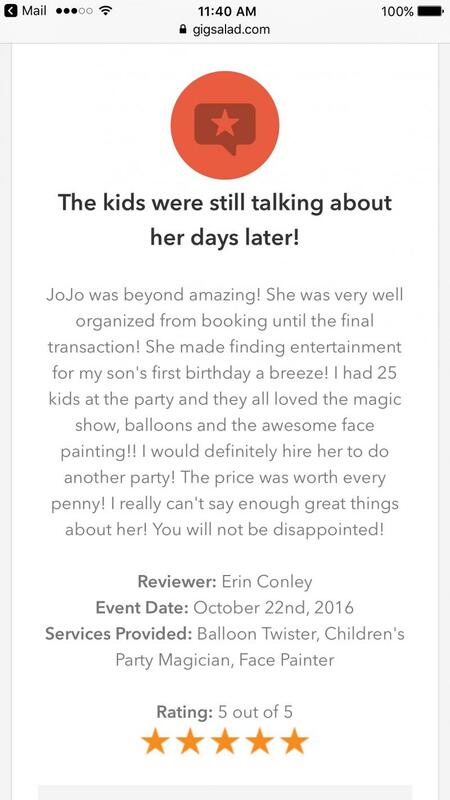 We hired JOJO for my son's 1st birthday in July 2012 and she was absolutely fantastic. She arrived on time and prepared to entertain. Her energy level was fantastic and we were very pleased. There were kids of many different ages ranging from 1 to 11 years old and she was able to keep everyones attention, even the adults enjoyed the show. The birthday boy was not afraid of her and seemed to enjoy every bit of it. He was specially happy with his ELMO ballon, that JOJO made. The party was a success and I have thank JOJO for it, she really did entertain the kids. I have friends whose kids are still talking about her and her wonderful show. We are looking forward to having her again in the future to help celebrate my other son's first birthday. JOJO, thank you for making his birthday extra special!! JoJo and her assistant, Jenna, were honored to be invited to face paint and do glitter tattoos for Soccer Night in Newton. Below is a thank you letter from the community of Newtown, CT. It’s a very touching letter for everyone to read, and how we touched the kids and people of Newtown, CT. Please pass this letter on too the other face painters, tattoo artist, and glitter artists who were also participating in this event. On behalf of Major League Soccer and the Houston Dynamo…….Thank you very much for the time and resources that you all did. We will be back in Newtown, CT for another event in the spring months for another community event. On behalf of the Newtown Youth Academy, the community of Newtown and myself, I would like to thank each and everyone of you who participated and Chris for keeping his heart true to the cause. Please pass this email on to those that were apart of your outreach for this event. The outpouring of compassion and concern for our community and our youth in particular was heart warming to see and experience. This event goes to the very core of what NYA is committed to both as an organization and facility. 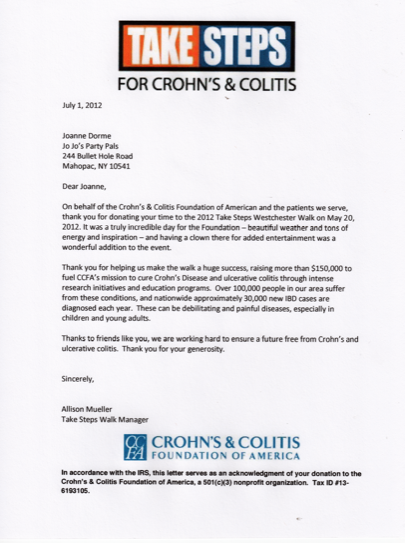 It is only with help of our community that our mission can truly be fulfilled. I am very grateful and appreciative of the time that you all took to be away from your own families, friends and loved ones and it is your commitment that made this event a success. All of you have helped in your on special way and it is through all of that help that I feel like the soccer community last night, the group of players, celebrities, professionals, teams, colleges and organizations.....may have become more like a family. ﻿Hi. I just wanted to thank you very much for the entertainment at Mairead's party yesterday. The kids had a blast! The face painting and balloons were a huge hit! They looked amazing. Thank you again. They were very entertained the entire time! Nicole L., Yorktown Heights, N.Y. 3/9/13. Dear JoJo, thank you for making our daughter Mary's 4th birthday a great party! The kids just loved you! They loved your magic tricks and the bunny. One parent told me the party was the best ever. Mary really loved the personalized gift you made her. We will certainly book you again! I want to thank you so much for everything you did today....you were AMAZING!!!!! your ears must have been ringing tonight, because my three children kept talking about you all night long. I will definitely pass your name around. You truly have a gift and you really brought sunshine to a rainy day. Thank you again for making my Girl's birthday so memorable. PS: While I sit back and reflect on the day I just realized in all of my craziness and upset that I never tipped you. Please except my apology. 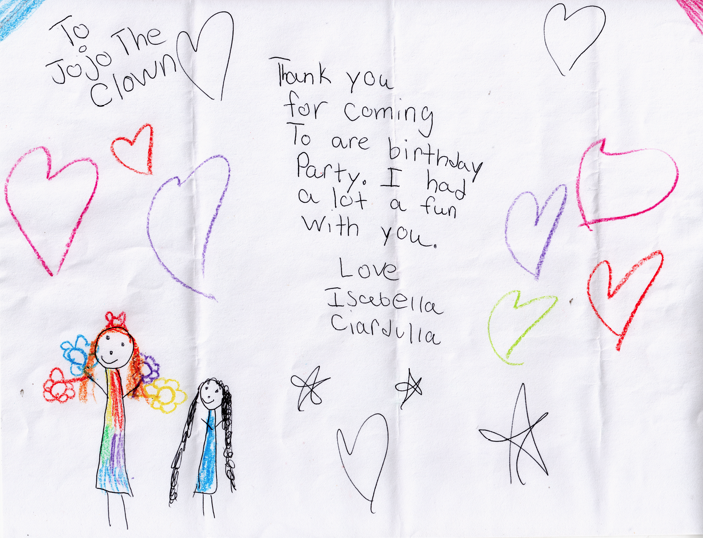 You will be receiving a note from Isabella and Alessia. Thank you and I am so sorry again! Just wanted to thank you again for a wonderful party for Carly last night. 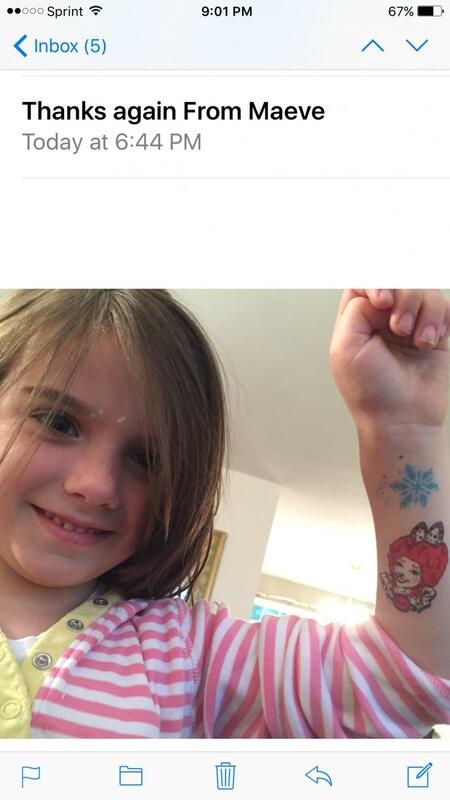 You helped make her birthday party so special, one that she will remember for a very long time. The kids were still telling me this morning how they could not believe that a rabbit was made out of magic. Carly loved her goodie bag. I wish you could have seen the look of delight on her face when she found the whoopee cushion. She has always wanted one. 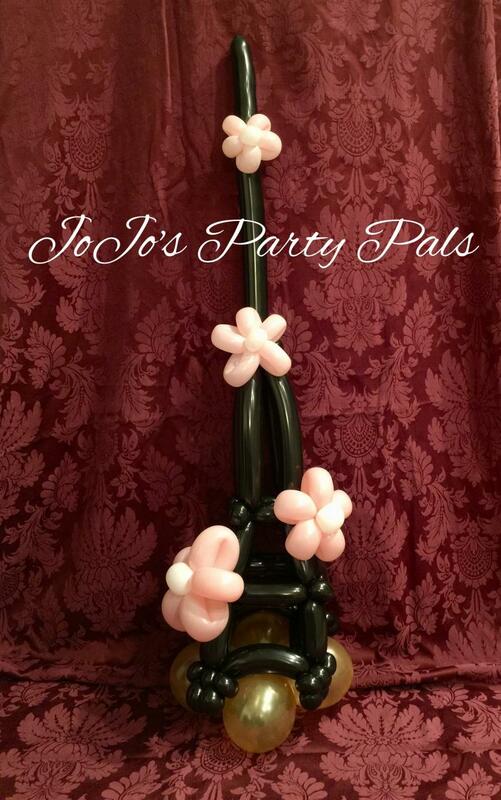 All of the personalized gifts were such a lovely touch and elevated the party to a truly special experience for her. 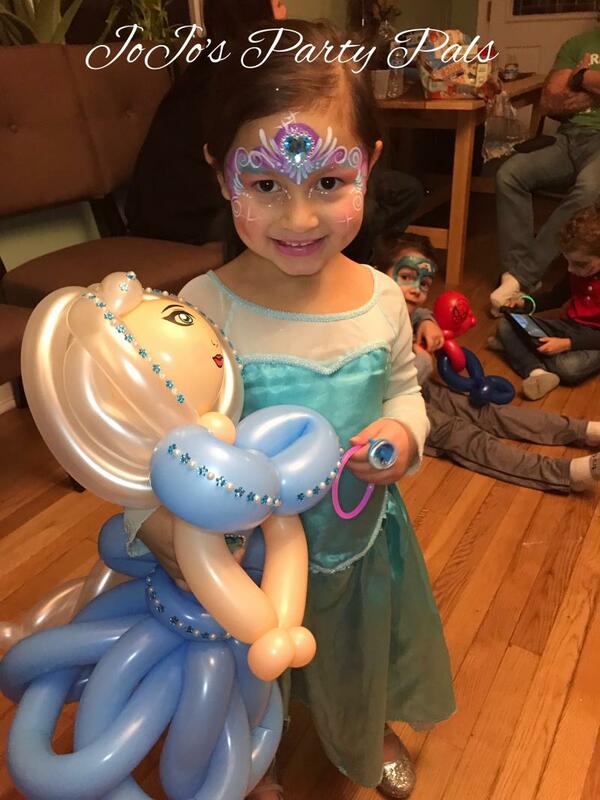 Thanks for bringing your magic to her party! You are so talented. Thank you for all the special things you did for my kids. We loved you. Everyone who saw your Elmo, Dora and Foofa balloons were amazed. Thanks again for everything and I look forward to working with you in the future. 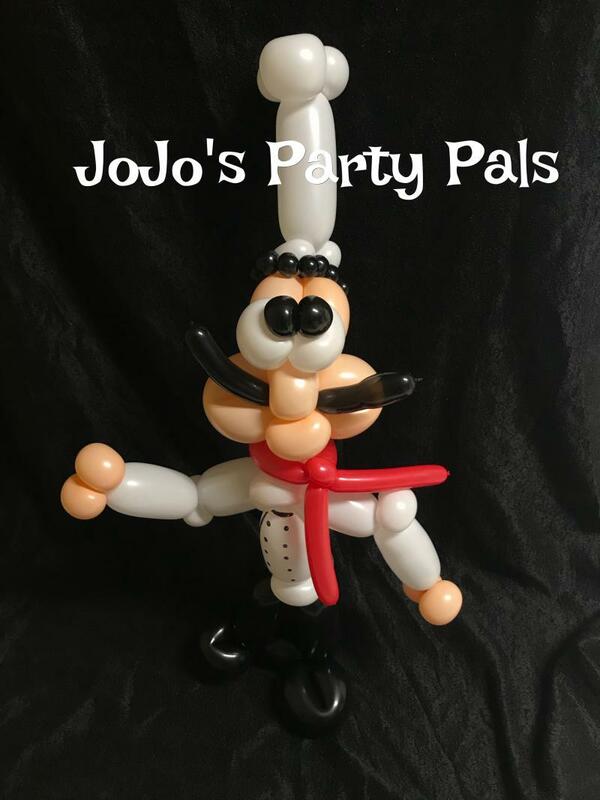 Copyright 2019 JoJo's Party Pals, Inc. All rights reserved.